'Horizon' #4 is off and running as Zhia and her team are on the run from the law and it's the most exciting opening sequence you'll find in comics. Penciller Juan Gedeon and colorist Frank Martin know action. If you've been following the series you know Gedeon has a unique art style, built on expressing motion that sometimes sacrifices detail for sheer visceral excitement. In this newest chapter, the opening car chase is a shot of adrenaline that builds and builds until coming to an explosive end. Gedeon's shaky frenetic lines give each panel a sense of movement and the layouts perfectly choreograph the pulse-pounding pursuit. It's the highlight of the issue. Meanwhile, Brandon Thomas' script bursts out of the gate with that great chase and slowly turns Zhia's group from the hunted to the hunter. There's also a heart to the issue amid the frenzy. Getting Finn back from the agents galvanizes the team and adds an emotional element to all the exciting twists and turns in the issue. The introduction of a new game-changing character sets up the next issue with a brief but effective scene. 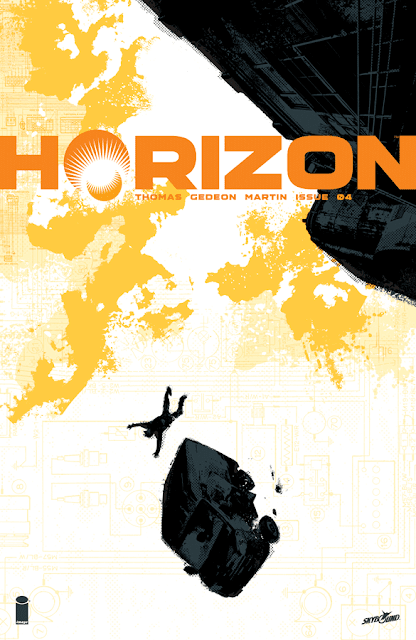 'Horizon' continues to build on a larger narrative that while exciting in pieces should probably be enjoyed as a whole when the trade paperwork arrives. Nonetheless, this latest chapter is a masterpiece of explosive action with a unique look and feel from Gedeon and Martin. Hold on to your butts, and get this series.